Aptamers represent the novel class of oligonucleotides holding multiple applications in the area of biomedicine. The advancements introduced with the Systematic Evolution of Ligands by EXponential enrichment (SELEX) approach further eased the scope of producing modified aptamers within a short span yet retaining the properties of stability and applicability. 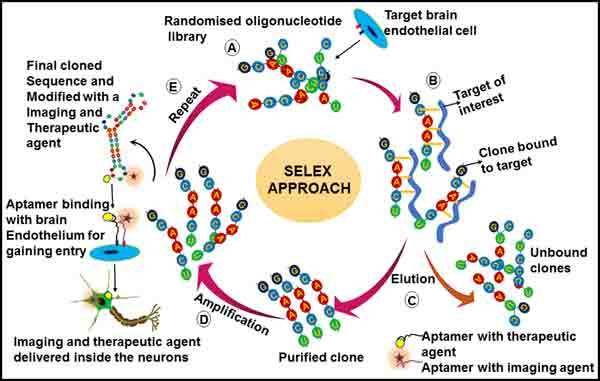 In the recent times, aptamers were identified to have the potential for penetrating into the deep human crevices and thus can be utilized in addressing the issues of complex neurological disorders. Considering the specificity and stability enhancement by chemical modifications, aptamer-based nanotechnologies may have great potential for future therapeutics and diagnostics (theranostics). The research community has already witnessed success with the approval of macugen (an anti-vascular endothelial growth factor aptamer) for treating degenerating eye disease, and hopefully those that are in the clinical trials will soon be translated for human application. Herein, we have summarized the aptamer chemistry, aptamer-nanoconjugates and their applications against neurological diseases. Aptamers, Blood brain barrier, Nano-aptamer conjugation, Neurological diseases, Pharmacokinetics, SELEX. Nanomedicine-Laboratory of Immunology and Molecular Biomedical Research (NLIMBR), School of Medicine (SoM), Molecular and Medical Research (MMR) Strategic Research Centre, Faculty of Health, Deakin University, Geelong Technology Precinct (GTP), Pigdons Road, Waurn Ponds, Geelong, Victoria 3217. Australia.